Fennel and cannellini is a very Mediterranean combination, then if you accompany it with feta, there is no more doubt about it. Fennel is perfect for soups and purées, and of course in so many other ways too. When I make those purée types of soups, I cannot help it to accompany it with a tartine of country bread and with some kind of cheese, Roquefort, ricotta, feta, goat cheese, anything that will enhance a spoonful of that sweet fennel flavor. My favorite alcoholic aperitif being pastis, I love fennel since its sweet anis flavor reminds me of Marseille and the South of France. If you ever end up in Marseille, you have to drink a pastis, it’s the local drink and incredibly refreshing during summer time…of course if you like anis. Technically what is the difference between a cream, a velouté, a bisque, when talking about a soup? Their main common point is that they’re thick and blended soups. Yes, in the French language there are quite a lot of words to describe “a soup” but they all have very distinct and precise meanings, there are so many nuances that sometimes it’s intricate to explain them accurately. The velouté is a blended soup, creamy and unctuous and enhanced by cream that contains meats and crustaceans. The cream is made out of pure vegetables combined with crème fraîche. Bisque is a velouté in which its main ingredient is a crustacean and thickened by yolks and cream. Then of course, we have the bouillon and the consommé, which are broth based and have a liquid texture. The word soup is a generic one, and does not give you any information on the type of soup you are eating…just a soup. I did not add cream in my cream of fennel, so technically it cannot be called “cream”, you can add crème fraîche at the end like it should, I am just keeping things light, so au revoir la crème. Heat olive oil in a large pot and brown onions, then add fennel and thyme. Stir well to coat the fennel, then add broth (enough just to cover the fennel mixture), adjust with salt and pepper. When the fennel is cooked, add cooked cannellini beans, and let the soup for about 10 minutes (adjust broth if necessary). Remove from heat and blend in a blender into a thin mixture. For the tartines, crumble carefully feta cheese in a container, add spices, herbs and oil. Mix carefully not to break the cheese. Toast slices of bread and top if with cheese. This entry was posted by silvia on April 8, 2010 at 11:10 pm, and is filed under Soups. Follow any responses to this post through RSS 2.0.You can leave a response or trackback from your own site. oh,silvia,such a beautiful presentation! delicious soup and tartines,i love the combination ! The soup and that tartine…I don’t know which to eat first! I think I’ll take the Roquefort with my tartine. Beautiful color on the finished soup. Fennel and cannellini beans never tried the combination sounds interesting. Such a delightful soup! I prefer it without creme too! Thanks for sharing, I love this recipe!!!! wow this looks amazing and what a beautiful presentation! I can tell by the ingredients this is wonderful and rich in flavors, and as always your enticing pictures will make everyone want to try this one bellissimo! Ah, so it’s the beans that make it so wonderfully thick without adding any cream (and calories). Very nice indeed! I love eating soups and I love the flavor and texture of cannellini beans, I will have to give this a try! What a gorgeous meal! I could go for some of that on this rainy day! This is a must try. I bought a Health Master that will make quick work of this lovely soup. I love soups with cannellini beans. This looks divine. I’m going to buy fennel for the first time this week for a different recipe. Now I can add this to the list. I agree – looks beautiful. I could veganize by using vegetable soup. Looks delicious, filling, and somewhat easy to make. My favorite combination! I didn’t realize to be termed a bisque it contains crustacean! 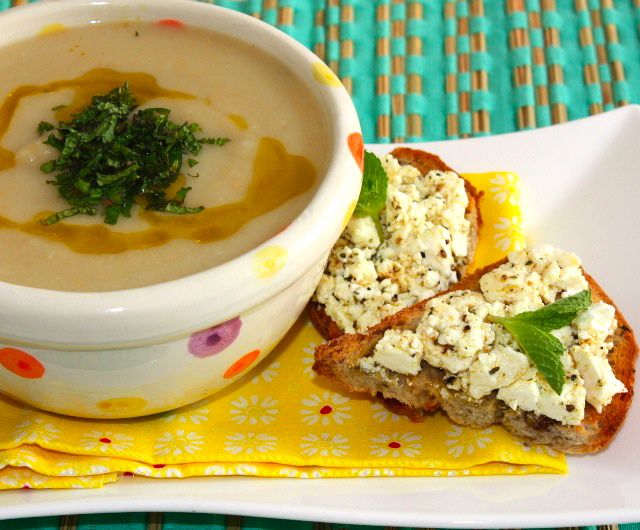 A beautiful soup and tasty looking tartines accompaniment (love feta!). Your recipe uses so many things we have in the garden right now — mint, fennel, thyme. Even onion. And it is beautiful with the little cheese toasts. You got the timing exactly right for seasonal eating. What a great sounding dish! I don’t use fennel enough in my cooking, I should try it more. looks delicious – i love your combination of flavors. and i learned the difference between soups – neat! lovely food, and lovely photos. so tempting! looking at this is making me hungry. I love making velouté in colder weather. 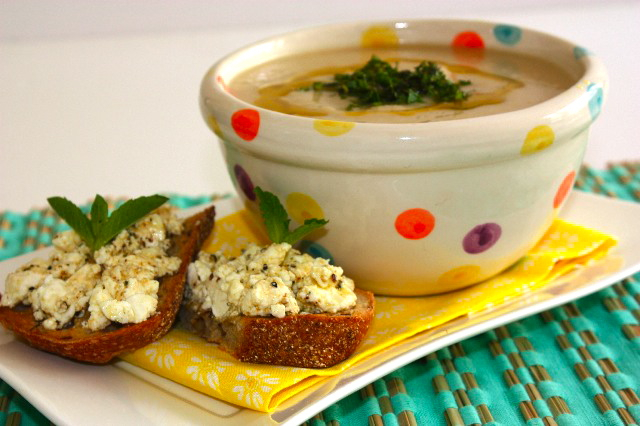 What a lovely soup, and those tartines of Feta are heavenly! Comforting, warming and packed with flavour. Give me some soup, please! I have just returned from vacation–time to catch up on my reading. You have been busy! I love little toasts like this, especially when they are sitting beside such a comforting soup.